It’s no secret that Stories are a big deal on Instagram. But the fact that over 400 million people use Stories daily may come as a surprise to anyone who’s been sleeping on them. The recent explosion of storytelling content is no accident, though. In fact, Instagram has been pushing hard for brands and users alike to hop on the Stories bandwagon. 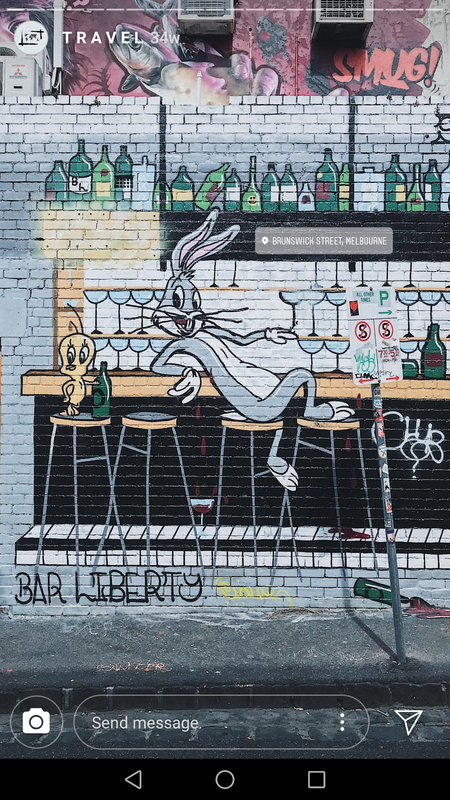 Engaging features such as the Questions Sticker and creative touches like Music make Stories truly one-of-a-kind in terms of content on Instagram. Meanwhile, the introduction of Stories ads for brands is also telling in terms of Stories’ selling power. The takeaway here? Stories are no longer seen as a novelty. At this point, they’re a staple of Instagram itself. But if you don’t quite “get” Stories or how they work, their popularity might leave you scratching your head a bit. Don’t fret. In this guide, we’re going to break down how to use Instagram Stories for your business or brand. From what makes a proper post to best practices to ensure your Stories don’t go unnoticed, we’ve got you covered. What’s So Special About Instagram Stories, Anyway? First thing’s first: let’s break down how Stories work in plain English. Introduced as a sort of successor to Snapchat’s “self-destruct” style of content, the concept of Stories is actually pretty simple. In short, Stories allow users to create a feed of sequential content that disappears within 24 hours of being posted. Story content can either be static photos or video, including video created via Boomerang. Think of Stories as a sort of secondary, exclusive feed of content for your most dedicated followers. Creative touches such as unique captions and overlays make Stories totally different from traditional posts. Story content is also prioritized in the sense that Instagram highlights updated Stories upfront in your feed. The purple circle around your profile photo lets followers know that you’ve recently added to your Story. This creates a sense of urgency and scarcity around your Stories, making them a sort of must-see, for-your-eyes-only content that’s exclusive for followers in the know. That said, you can save Stories to your homepage to turn them into static content in the form of “Highlights.” Here’s an example from Funko’s page which promotes tons of highlighted past Stories under their bio. Between their time-sensitive nature and creative freedom, there’s plenty that businesses can do to take advantage of this format. That said, you might still have trouble wrapping your heads around how to use Instagram Stories for business. After all, creative freedom can be daunting. Also, with no tagging or captions available, where do you even start with Stories? Stories’ creative quirks and sequential style actually make it prime for a variety of campaigns for businesses. Below we’ve highlighted five different types of Stories which are popular with brands of all shapes and sizes. Stories’ sequential format makes them perfect for step-by-step, how-to style content. From recipes to beauty tutorials and beyond, bite-sized educational content is an engaging alternative to traditional video or blog post. Many brands share Stories dedicated to their followers’ user-generated content such as tagged customer photos. 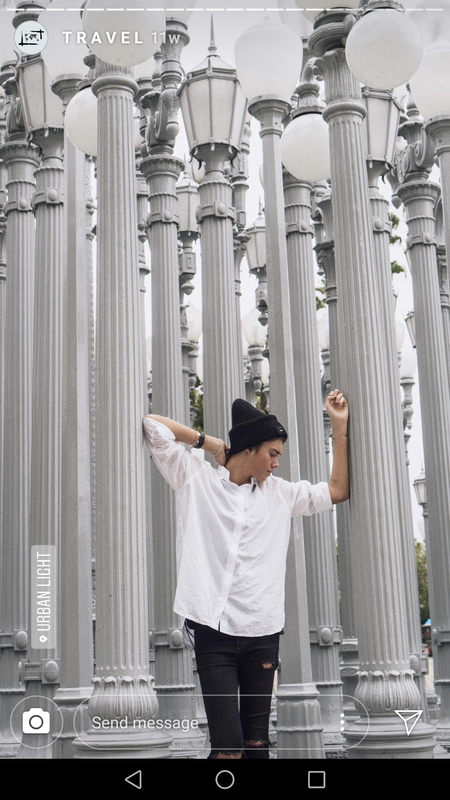 For example, Converse uses their #FOREVERCHUCK hashtag to show off follower photos in a massive Story slideshow. Stories represent a fantastic place to publish UGC if you don’t want it to dominate your main feed. This is especially important as you don’t want your valuable shout-outs from followers to go to waste. Part of the beauty of Instagram Stories is that they don’t have to be big, polished productions. In fact, many brands create Stories that are sort of off-the-cuff while attending public events or industry conferences. In a sense, Stories allow brands to take their followers along for the ride. 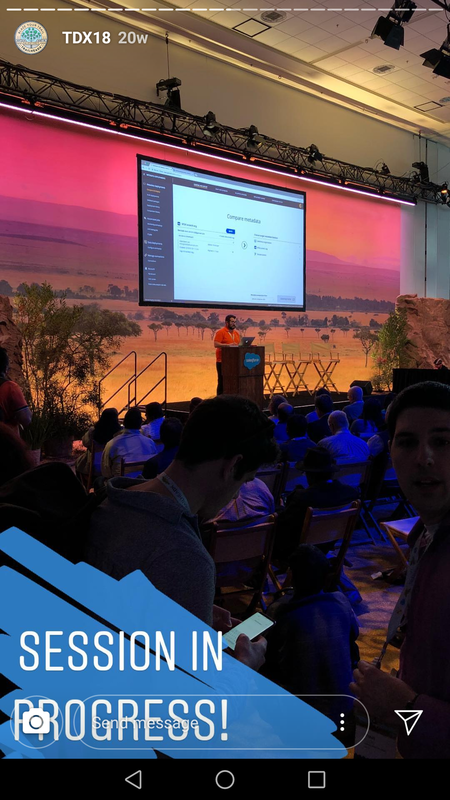 Here’s a recent example from Salesforce’s recent Story from their TrailheaDX 2018 conference. Promoted with the #TDX18 hashtag, Salesforce showcased everything from real-time presentations to happenings at booths around the conference. 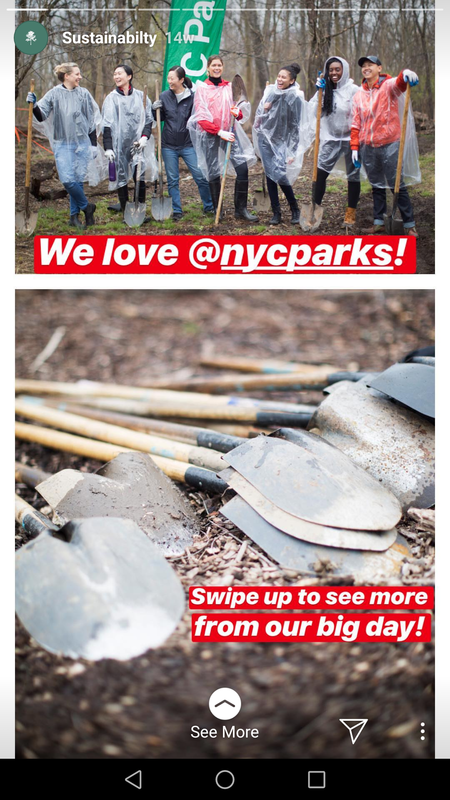 And for brands who want to go behind-the-scenes without taking up any valuable real estate on their feed, look no further than your latest Story. Fashion giant Uniqlo‘s main feed is dedicated to showing off their latest styles and fits. To show their team some love, the brand has dedicated Highlights to celebrating their public service and community outreach. If you’re struggling to figure out how to use Instagram Stories, consider putting the human side of your business on display. 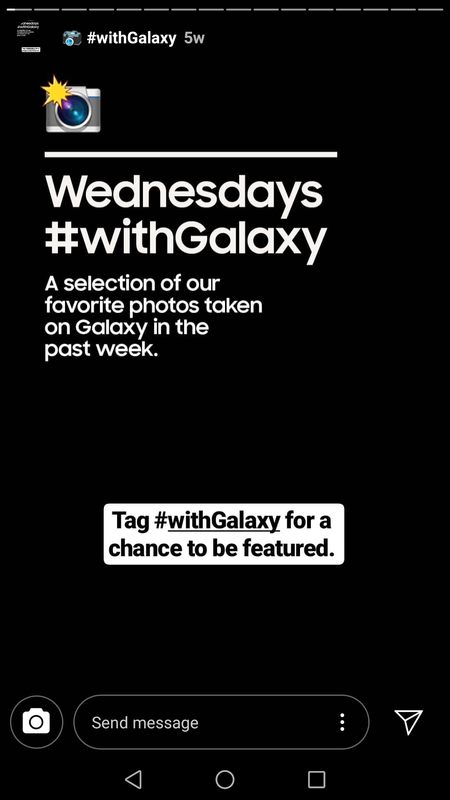 Just as you’d promote an offer via Instagram, you can do the same via Stories. Perfect for ecommerce and brick-and-mortar stores alike, Stories can be used for limited-time deals or simply to highlight a current sale. 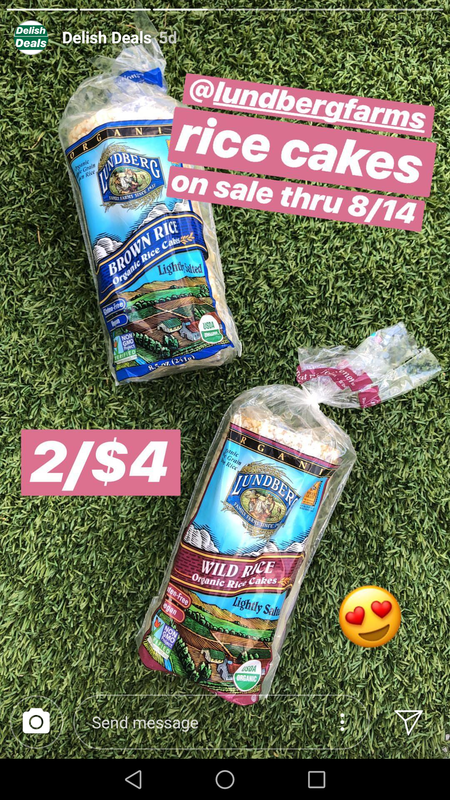 For example, Whole Foods‘ “Delish Deals” Story shows off items which are on sale at their stores and provides an end-date so there’s no confusion for followers. Story-specific offers are a smart move to encourage people to stay glued to your Instagram for fresh deals and updates on a regular basis. Announcements that keep your followers guessing through every step of your Story represents one of the most creative ways to use the format. For example, Southwest used a Story to tease their recent Shark Week promotion. 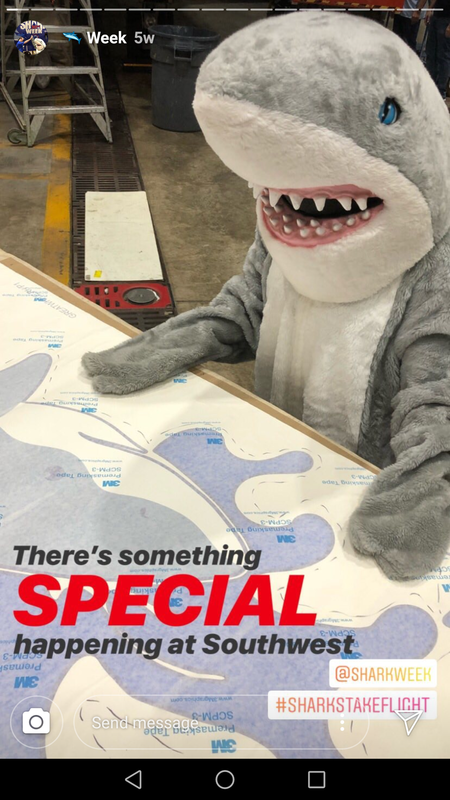 Their initial post hyped that something special was going on with someone in a shark costume and little context. This playful sort of content is perfect for piquing people’s interest. 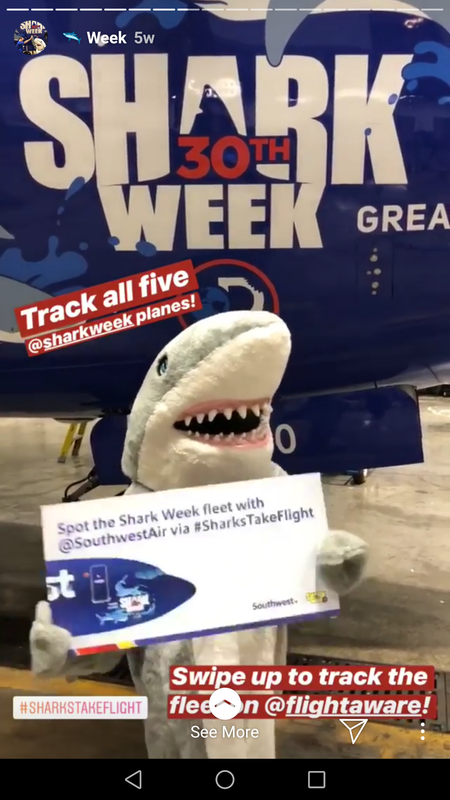 The Story went on to eventually reveal their hashtag promotion #SharksTakeFlight to spot their fleet of Shark Week planes in the air. As you can see, there’s no “right” approach for those trying to figure out how to use Instagram Stories for business. In fact, any combination of these types of posts is totally fair game. That said, just because you understand the types of Stories available doesn’t mean your content is must-see. In order to get more eyeballs on your Stories, let’s quickly touch on the format’s best practices. So, what should businesses focus on if they want to squeeze the most out of their Stories? Here’s some food for thought: the 400 million people using Stories daily represents about 40% of Instagram’s base of active users (1 billion). In other words, although Stories are wildly popular, not everyone is on board quite yet. So if you’re posting fresh content to your Stories, don’t be afraid to let your followers know about it. Although your Stories don’t need to tick these boxes 100% of the time, consider them an added bonus for winning people’s attention. Perhaps a no-brainer, make sure that any text you include on your photos is legible. 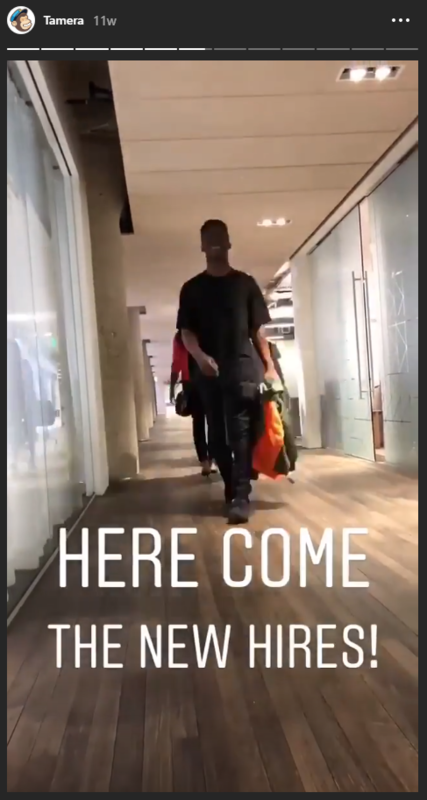 Instagram’s default sans-serif font is easy to read, but brands might understandably want to experiment with different font packs or colors. That’s totally fine, granted you’re not using clashing colors or something that might be tough to read via mobile (think: red on orange). Likewise, don’t crowd your Stories with too much text and run the risk of overwhelming your followers. With more and more brands trying out Stories for size, going the extra mile in terms of creativity can help your Stories stand out from the crowd. What sort of tactics are we talking about, though? Below are some key strategies and tools to help your Stories pack an extra punch in your followers’ feeds. 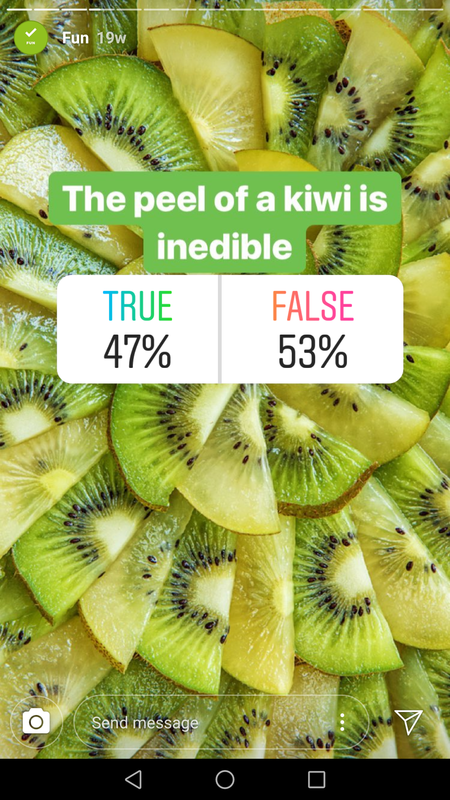 Polls and Question Stickers instantly make your Stories more interactive, encouraging engagement from your followers from the word “go.” These features represent a playful way to pick your followers’ brains. 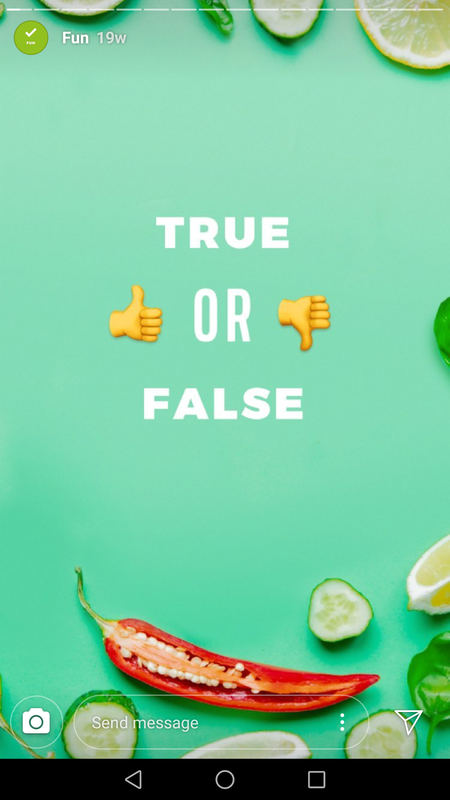 Brands like Hello Fresh regularly run quizzes to go back-and-forth with their followers. Later in their Stories, they post the results so those quizzed can see how they did. Rather than let your Stories gather cobwebs, these elements represent a sort of call-to-action to engage your followers. 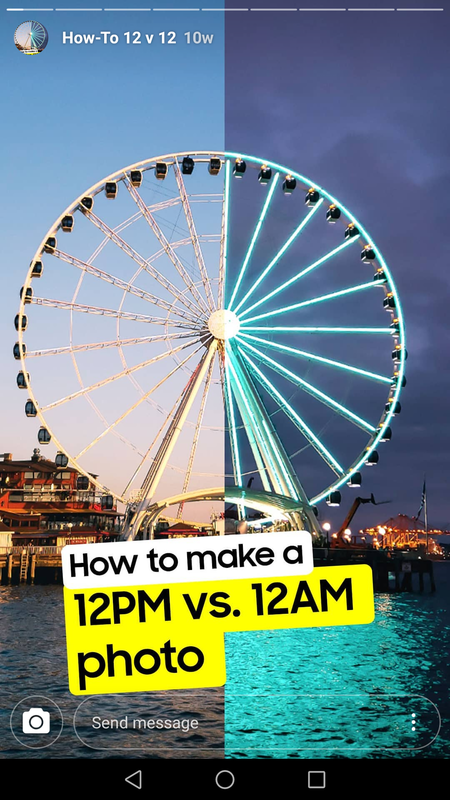 In addition to Boomerang, there are a number of Instagram apps such as Hype Type, Over and Adobe Spark with features specifically tailored for Stories. From font packs to creative overlays, a paid app may be just the resource you need to take your photos to another level creatively. And of course, what better way to ensure that your Story stands out than by running an ad? In short, paid Stories are brilliant for brands with the budget to create their own bite-sized commercials. As long as you can work within Stories’ specific specs and know your target audience, you’re golden. Still strapped for ideas on how to use Instagram Stories? How about we look at some top-tier brands in action? To drive home just how diverse Story-based campaigns can be, we’ve highlighted five recent Stories to serve as some much-needed inspiration. Stories are the bread and butter of influencers and solo brands for a reason. Perfect for travel bloggers or anyone on-the-go, Stories allow you to take your followers on the proverbial journey with you. Influencer Marc Ritz highlights his travels around the world, taking eye-popping photos to share with his followers along every stop. These sort of organic photos in-the-wild represent the sort of content that the Instagram community at large absolutely loves. As it should come as no surprise, the ultimate intention of Stories is to, well, tell a story. However, consider that sometimes the most compelling Stories don’t come from you. Instead, they come from your fans and followers. 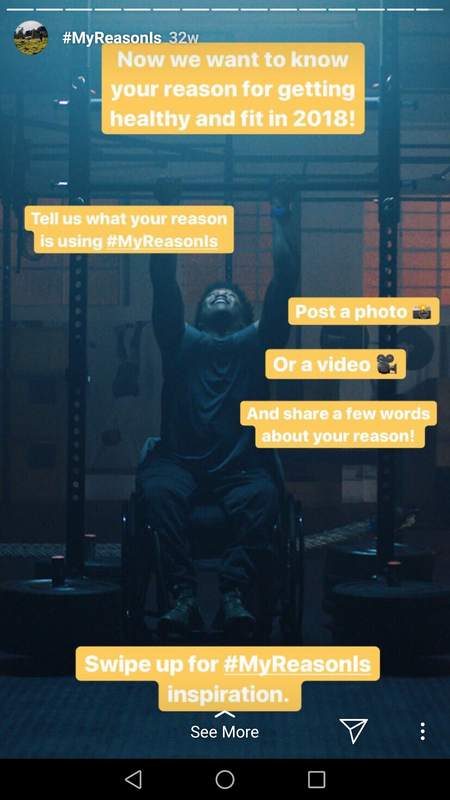 For example, check out Fitbit‘s motivational #MyReasonIs campaign. Using the brand’s hashtag, followers were encouraged to share their reasons for getting fit in 2018 for a chance to be featured in a Story. From humorous to heartfelt, this user-generated content campaign is a shining example of the power of visual storytelling. As noted, Stories allow brands to go step-by-step and teach followers a thing or two without being totally formal about it. 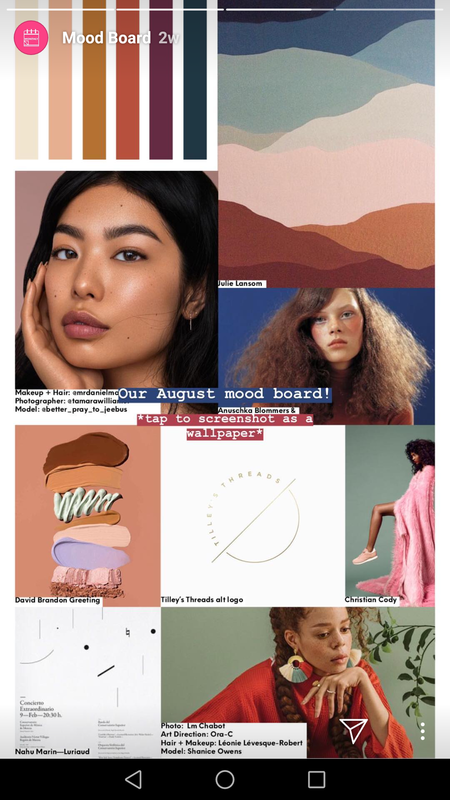 Brands like Ipsy use Stories to not only create beauty tutorials but also monthly “mood boards.” These collage-style posts are packed with tips and inspiration, all in a single photo. These sorts of Stories also display the content marketing potential of Instagram when brands get creative. As we mentioned earlier, events, conventions and conferences are tailor-made for Stories. If you spot something of interest while you’re out and about, chances are your followers would be interested, too. 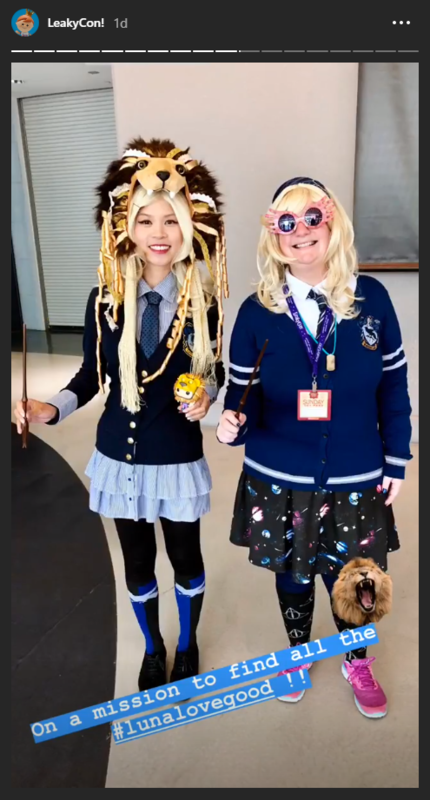 For example, Funko’s Instagram shows off cosplayers and other happenings at conventions that their followers can geek out about. 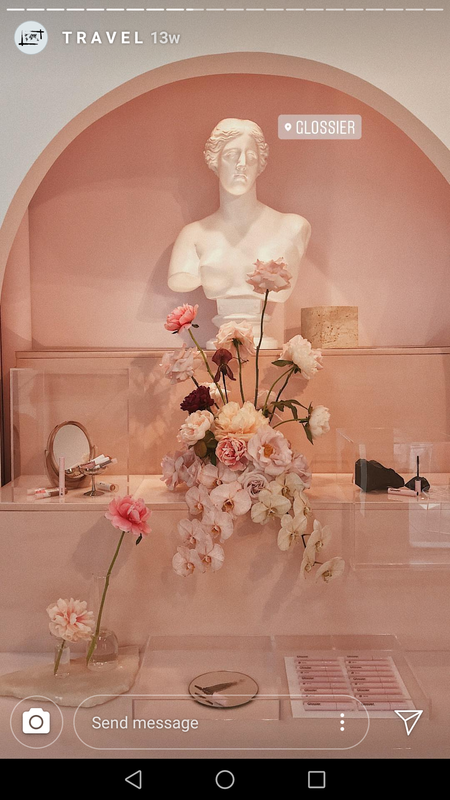 Consider that followers crave a sense of authenticity from the brands they support. What better way to “get real” with your fans than by taking them to your office or showing off your team? For example, MailChimp’s recently ran a series of day-in-the-life Stories. Each Story highlighted individual members and their day-to-day roles at MailChimp, including bringing on new hires. Remember: Stories don’t need to be a massive production. Armed with a smartphone and best practices in mind, you can start creating them today. Have You Figured Out How to Use Instagram Stories for Your Business? 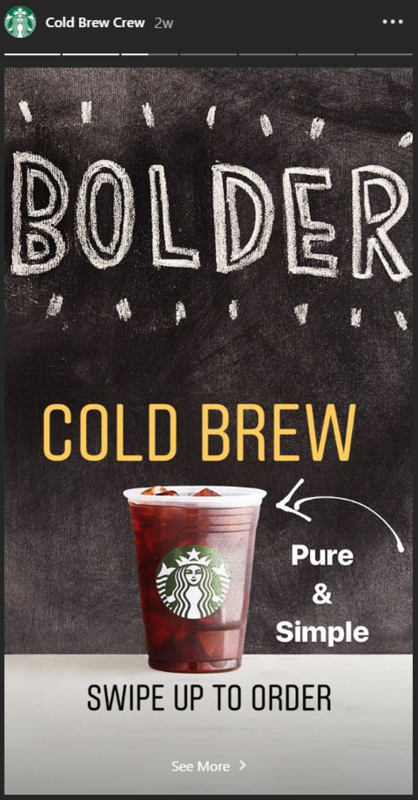 Given that Instagram is focusing so heavily on Stories and the format only appears to be getting bigger, brands should get on board with them ASAP. By understanding the best practices above, you can stay ahead of the curve and keep your followers engaged via Stories without missing a beat. 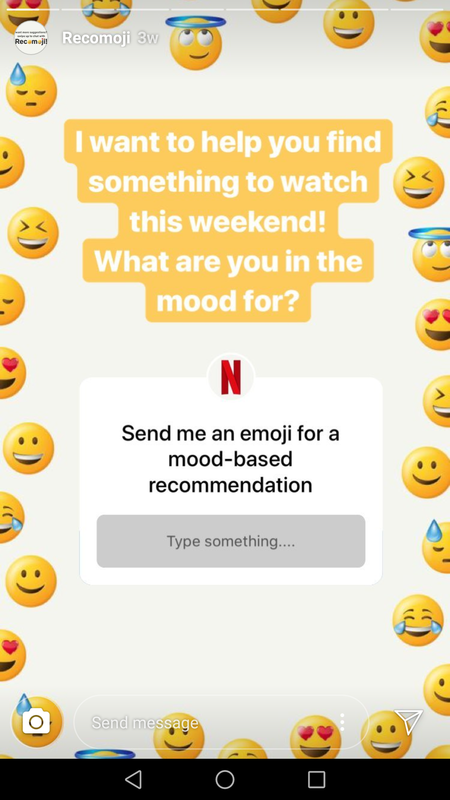 We want to hear from you, though! How do you feel about the popularity of Instagram Stories? How are you using them yourself? Let us know in the comments below.